Dorint hotel on Friday and Saturday and the wind mills and the dinner on Saturday night. We have so many plans as a result of these three days. We will tell you more about them in this issue of the Global Pituitary Voice. But before we get into the details, I would like to share some great news from Australia. 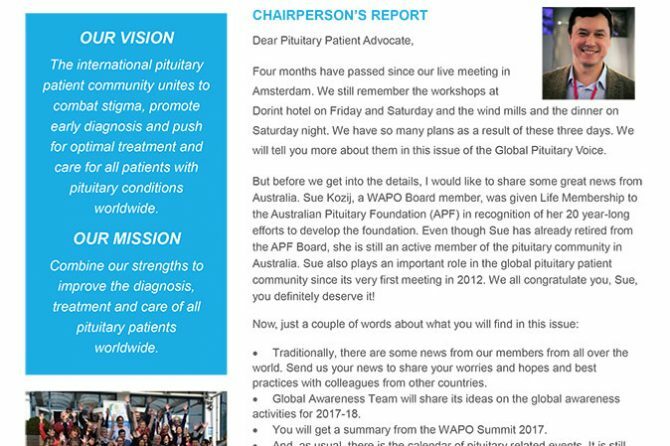 Sue Kozij, a WAPO Board member, was given Life Membership to the Australian Pituitary Foundation (APF) in recognition of her 20 year-long efforts to develop the foundation. Even though Sue has already retired from the APF Board, she is still an active member of the pituitary community in Australia. Sue also plays an important role in the global pituitary patient community since its very first meeting in 2012. We all congratulate you, Sue, you definitely deserve it! Traditionally, there are some news from our members from all over the world. Send us your news to share your worries and hopes and best practices with colleagues from other countries. Global Awareness Team will share its ideas on the global awareness activities for 2017-18. You will get a summary from the WAPO Summit 2017. And, as usual, there is the calendar of pituitary related events. It is still incomplete, and it is with your help only that we can enrich it with the most up-to-date information. 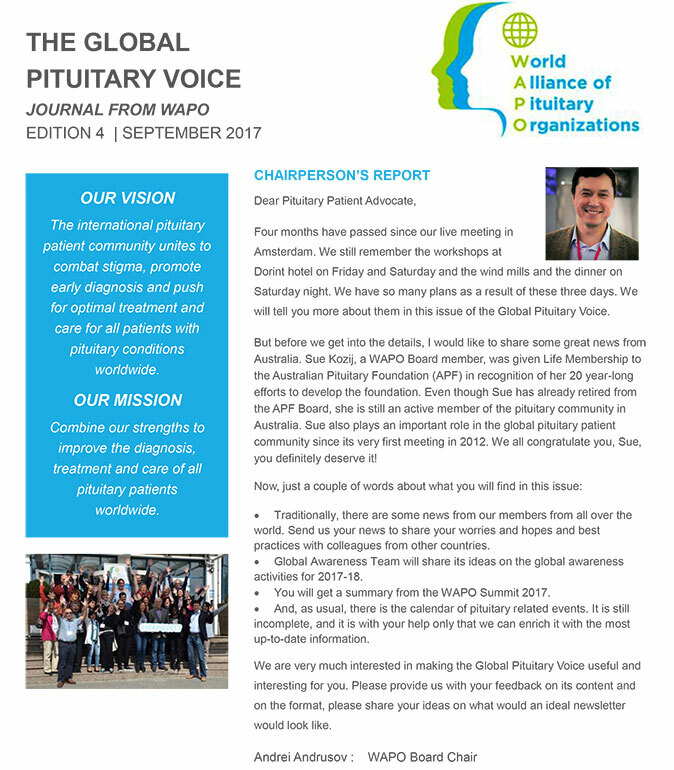 We are very much interested in making the Global Pituitary Voice useful and interesting for you. Please provide us with your feedback on its content and on the format, please share your ideas on what would an ideal newsletter would look like.